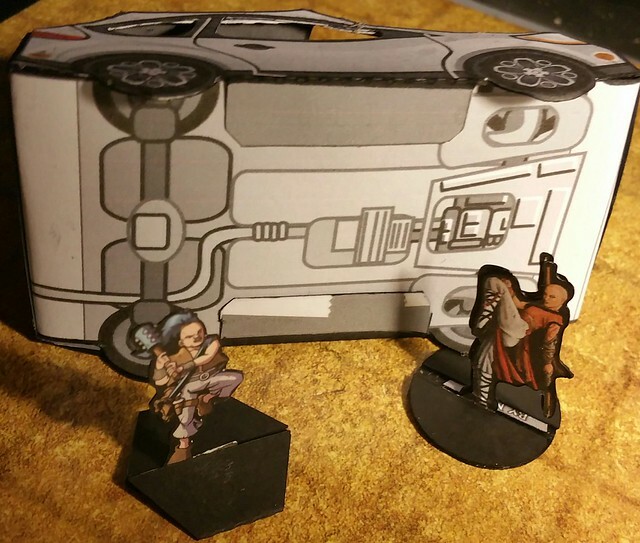 So my FLGS D&D 5e game is going on hiatus for 12 weeks, but one of our group has gone completely nuts for the new Mad Max is inspired to run Atomic Highway during the break. 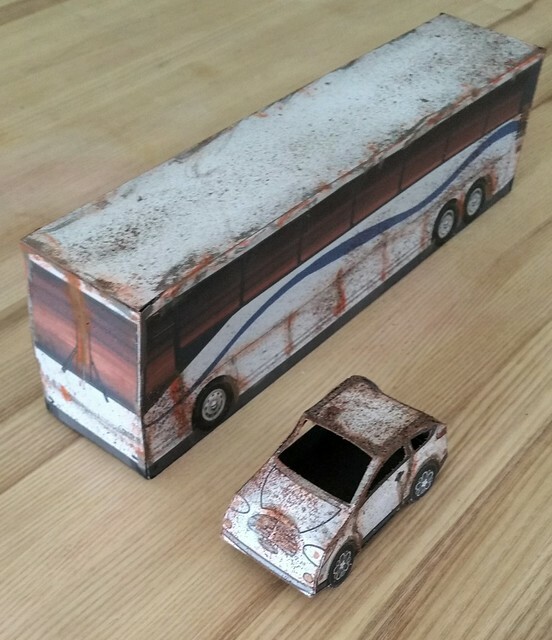 I've never played or run a post-apocalypse game, but am exited to bring my papercrafting skills to the table as a propmaster. "Fortune" tokens (cards): These are like Bennies/Action Points/Fate Points from other games - a resource to change the luck of a roll. Paper miniatures (and flat mini stands): I'll probably find my first cut at these on this very forum! Recommendations requested! Vehicles! 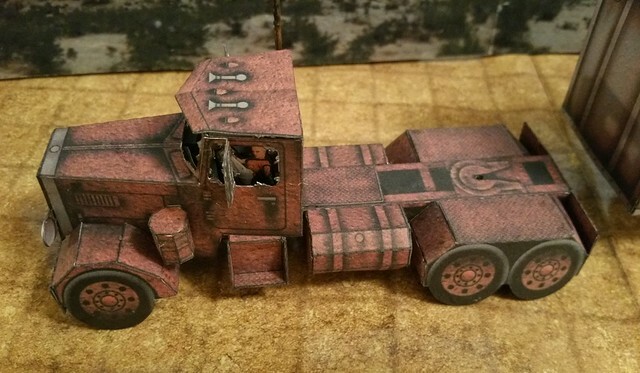 : I need a semi truck, various post-apocalyptic raiding vehicles, a dune buggy, a bus - all with weathering (or additionally some textures to lay over usual models to make them look beat up. 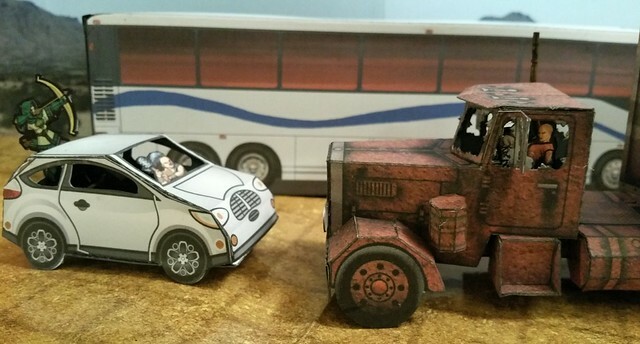 BTW, I'm planning on making the vehicles to be able to hold minis, and fold flat! If I create/mod/cut-trace anything, I'll share it on this thread. And, of course, any construction and play photos! So - help me with links, and I'll help us all with mods/cutfiles! Deal? 1 - First paper minis that come to mind are those by Dave Graffam. 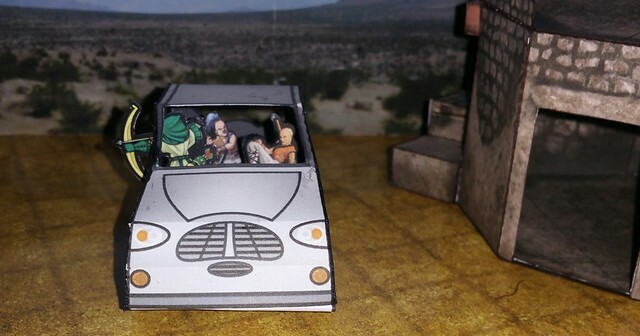 Official paper minis for Atomic Highway. They very reminiscent of Fallout series, imho. 2 - The free Fallout paper minis. They are old, they are stand-ups rather than current minis paper but they have front and back art. I found good resolution files on the new Kimerlin's site. Here! 4 - many paper mins ( old e new ) by Tomoko. 5 - several old sets by Onemonk. 6 - Mad Max by Nemo. Thanks Rhannon - Where are Dave's official figures for AH? I must be a doofus and can't find them. I'm trying to decide what to do with the oversized cutfiles. When I figure it out, I'll put up a different thread. Found them - they are gone from OBS, but still on Paizo. They look like mercenaries only. I think I want stuff that's more punky. Checking out the rest of your recommendations. I knew you'd all come through with great stuff instantly! :-) Thanks Rhannon (again) and squirmydad! There are lots of buses out there, like Greywolf's, greywolf.critter.net/paper.htm, and he has a lot of cars. 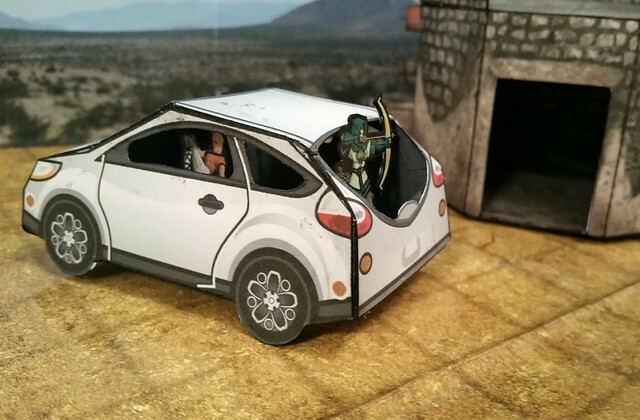 Rpgnow has a set for War of the Dead. 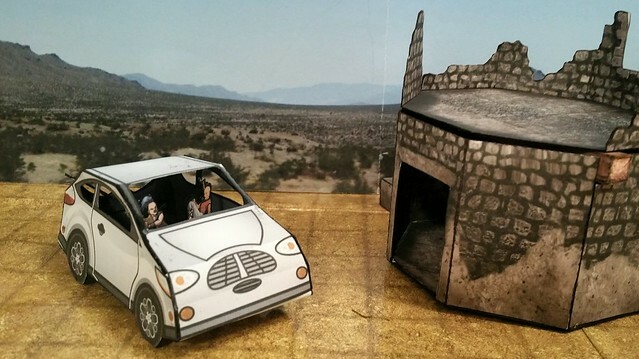 Its called paper dead, its mostly figure flats but it has a huge R.V in the back. I think you can see it in the quick preview. Also, the other set has jeeps and stuff. Not post apoc at first but could be modded. They used to have a set that I don't see on the page called "Wheels of the dead" that had humvees and othe cars. Maybe they still have it listed elsewhere. I just revisited Tommygun's models, www.modelpaperworld.com/en/7-buildings, and the modern ones would probably be helpful, too. How about some of Mauther's buildings and vehicles? Of course, he's talking about tomorrow's national holiday; Donut Day, in which I'll be participating heavily. In between batches of baking I'll get this fellow sorted and on the road. If you need apocalypde streets, Worldworksgames has it link. 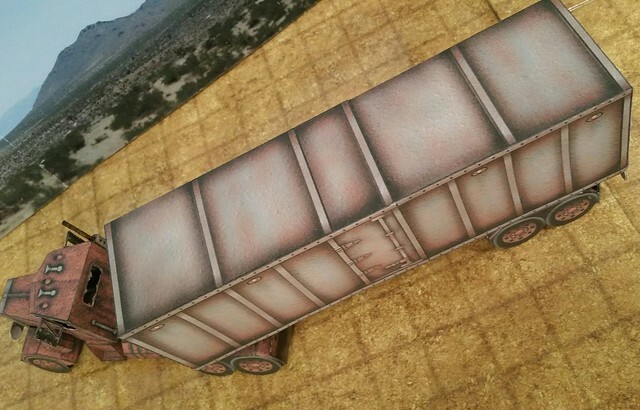 What percentage would you guys recommend printing ravensblight's ghost truck at to make it work for 28 mm? I'm working on cutfiles for this one now - as it is looks pretty good to me (I'm going for vehicles being 2" wide as scaling.) - will let you know. I wonder how impossible Mauther's Bedford would be to get close to scale. I've been grabbing stuff of Papermau left and right, but hadn't seen that beauty! Thanks! That sounds pretty small. What target scale are you looking for? I'm using the width of the container to judge the scale size, in D&D 1" = 5ft, so 2" wide seems pretty good (if not a little small) and for me that is 1:1 scale on 8.5x11" paper. I think I'll build the cab, check, then the container and recheck. The cab will get wider when the wheels (and wheel wells) are on - so total will be about 3" wide, but I'm more concerned with the cab and cargo container size myself. 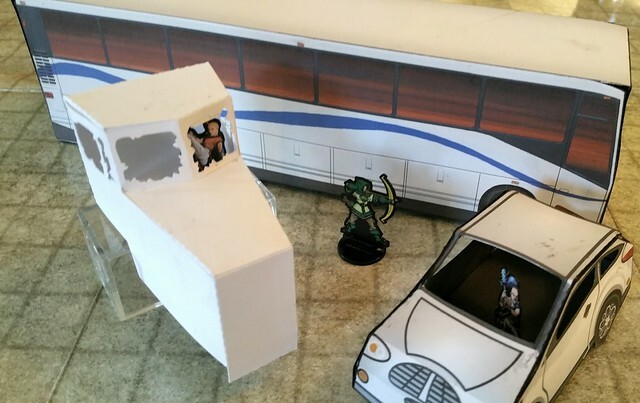 So *my* verdict is for 28-32mm paper minis: Print at full size. We'll see what the final looks like in a couple days. 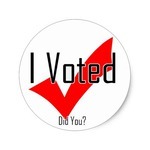 Have you decided on the type of setting? 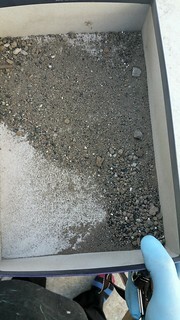 Desert? Outback? And I wonder if any of the paper slot cars would fit. They have a lot of '30's, 40's, and 50's cars, but a bit large. Just looked up the size of a shipping container, it is only 8 feet wide, so I may scale down 20% after all. 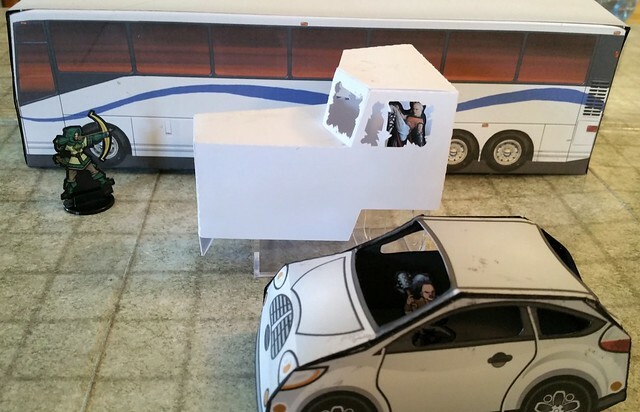 So - I built the Ghost Truck at 80%, rebuilt the White subcomact at 120% (down 80% from the last build), and the tour bus at 100% (larger model). Looks like a bad attempt to pass! I love the minis inside the vehicles. Looks like things are shaping up. Judging by the backdrop, looks like you are planning to do high desert for your setting. 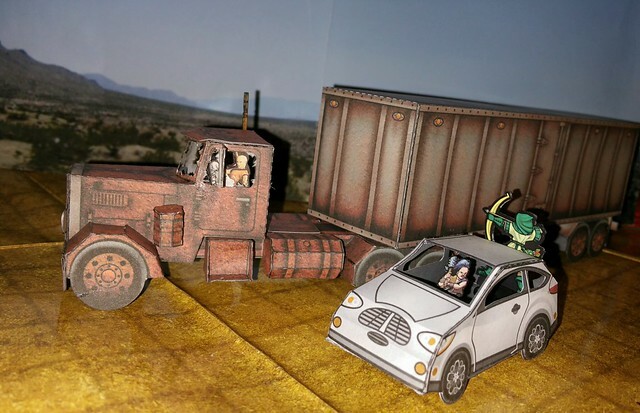 Did you see Ron Caudillo's Man Semi over at Mauther's blog today? 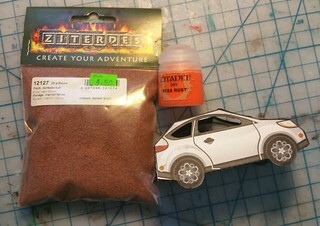 Would any of Volker's models from Streetpaper.DE or Racepaper.DE be of use? 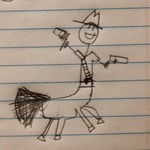 I don't see the Man Semi on Papermau Vermin King - could you post a pointer for me (and posterity)? Thanks! Thanks for all the pointers everyone! Looks like things are shaping up.